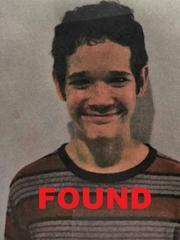 **FOUND** #LASD Missing At-Risk Juvenile from 2900 blk of Nido Dr. Altadena, Richard White, Male White, 12 y/o, 5'5"
Altadena missing person Richard White was found safe and uninjured on Wednesday, January 3rd, 2017 at approximately 1 P.M. with the assistance of the Azusa Police Department, Richard White was transported to a local hospital to be medically screened and reunited with his family. Detectives from the Los Angeles County Sheriff’s Department are seeking the public’s assistance in locating Richard White. 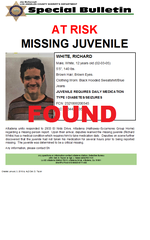 Richard was noticed missing on Tuesday, January 2, 2018 at 8:50 p.m. during a facility check at Hathaway-Sycamores Group Home, 2933 El Nido Drive, Altadena. Richard has walked away from the facility once before. Richard is a 12-year old White male, 5’5” tall, weighing 140 pounds. He has brown hair and brown eyes. He was last seen wearing a black hooded sweatshirt and blue jeans. Richard suffers from a medical condition which requires him to take medication daily and had not taken his medication prior to being reported missing. Anyone with information about this incident is encouraged to contact the Los Angeles County Sheriff's Department's Altadena Station, Detective Ojeda at (626) 798-1131 or (626) 798-2130. If you prefer to provide information anonymously, you may call "Crime Stoppers" by dialing (800) 222-TIPS (8477), use your smartphone by downloading the "P3 MOBILE APP" on Google Play or the App Store, or by using the website http://lacrimestoppers.org.